Love this module. Probably the best third party mod I’ve ever used or set up. Very intuitive and well documented. If you're not already collecting product reviews, or store testimonials, this module is a no-brainer. And if you're paying monthly fees, you should switch now. Easy to install and customize. Working great and the reviews are starting to roll in. This was a simple decision for us. We were looking for an alternative to what we had been using (Ratevoice). We were able to get all of our old Ratevoice reviews imported into Easy Review quickly. We like the "was the review helpful" feature that isn't available elsewhere. The content is stored on our website, so we will now get SEO credit for all of our reviews. Bruce is very capable in helping stores switch away from other software with ease. 5 of 9 customers found this helpful. We recently surveyed the review modules available and easily decided on Easy Review. Phosphor installed it and converted our data over with no problem! The module is so flexible I can't believe it! This is a great product review module and the Phosphor team is top notch and a pleasure to work with! I highly recommend Easy Review! I upgraded to Easy Review from the Sebenza reviews module. The data conversion went off without a hitch, and we were able to integrate the new module into our site in exactly the way we wanted. Display layout is very flexible and the module is able to be configured with microdata markup so review data are included in search engine results. 8 of 13 customers found this helpful. We just upgraded from the Sebenza module, and it is a huge instant improvement. This is the best review module available for Miva, hands down. The Phosphor team did a great job creating and installing it, and our old review data came over seamlessly. See it in Action. Here are just a few sites using Easy Review. Improve Page Ranking and Positioning. For stats junkies, here are more numbers about reviews and testimonials. 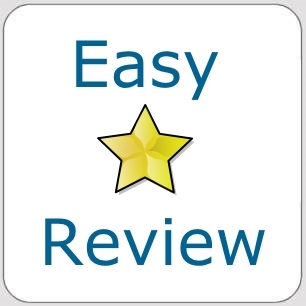 Easy Review is easy to install, manage and most of all, easy for YOUR customers to leave reviews and testimonials. After all, what's the use of a review system that no one uses? Easy Review comes ready to roll out within five minutes yet is completely flexible, letting you modify it any way you want. Better for SEO: Your Content, Your Site. This feature automatically sends a custom email to your customers asking for a review of the product they purchased. Set the number of days to send after either order date or product shipped date. This lets you display randomly selected reviews anywhere you feel it's appropriate for your store. The selection of reviews can be gated by review rating, and can be constrained by product (including store review) or category. Fully templated and styled via CSS giving you ultimate control over appearance. Point and Click settings if you just want to get up and running quickly. Review Voting: Let your customers tell others if they thought a review was helpful or not. You get to control who can post reviews and how reviews are approved. Proprietary anti-SPAM technology and an optional "email verification" system lets any REAL visitor safely leave a review without logging in. Full decimal averaging and half star rating support. Easily change "Star" icon shape and color. Verified Purchaser notice, shows if the reviewer has previously purchased the product from your store. Built in microdata support for even better SEO value. Customers review your products RIGHT ON the product page. No need to take them away to another page or hide the product information. Edit reviews and provide a store owner response for any review or testimonial...before and after approval. Ratings distribution popup. Shows how many 5, 4, 3, etc stars each product received. Automatically limits reviews and voting to one per product. Annotate reviews to help guide reviewers in writing reviews. Here are some stats on the effect of reviews and testimonials. 61% of customers read online reviews before making a purchase decision, and they are now essential for e-commerce sites. Easy Review is licensed for one year from the date of purchase. This includes free support, feature updates, and of course any bug fix releases. The renewal cost for Easy Review is: $78.00.